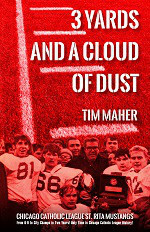 In an era when multi-millionaire athletes sit out games for reasons like “unspecified soreness” and “stiff neck,” Chicago-area sports personality Tim Maher has written a true tale about some of the most rugged young men anywhere: the City champion 1970 St. Rita Mustangs football team. 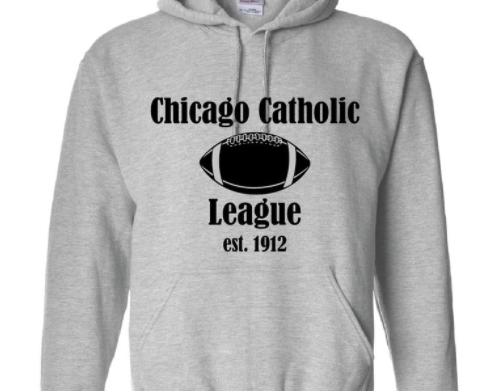 penned and self-published “3 Yards and a Cloud of Dust,” a 200-plus page book newly available in paperback for $14.95 at chicagocatholicleaguefootball.com. 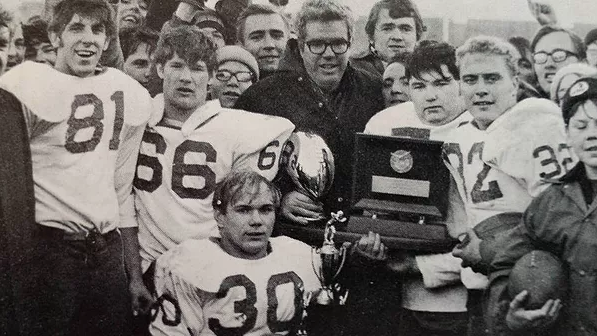 While some fans of Chicago Catholic League football history know of the storied squad—which amazingly went from 0-9 in 1968 to 9-2-1 in 1970—few, other than the players themselves, recall the details. But Maher, along with a handful of his teammates who are all now 64-year-olds scattered across the Southwest Side, the southwest suburbs and beyond, brings it all back: from the brutal summer practice sessions in Michigan to three November victories at Soldier Field over tough CCL opponents (Fenwick, Loyola and Leo) to a December Prep Bowl triumph over Lane Tech before a Soldier Field crowd of 65,745. 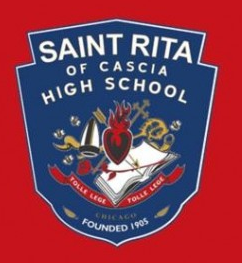 St. Rita alumni—and other Catholic high school graduates--will smile as they read descriptions of the mud, blood and thuds in the brick-walled tight space at St. Rita’s home field near 64th and Claremont—typically a path to glory for Mustang teams, usually a dead-end to defeat for opposing squads. The book brings back recollections of grit, of trials by fire, of coaches being tough on players as they turned boys into men—teaching them how to overcome adversity, how to be hard but fair, and more. “We didn’t have what [high school] football players have today. After a double-session practice in 100-degree heat, we’d get two salt tablets. Not like today--not bathed in water, not chugging down Gatorade. We had papaya juice—and it was great because it had grass, blood, snots, everything in it. You drank it, it had ice in it,” Maher chuckled. And so it goes in the book, less of a warm and fuzzy stroll down memory lane and more of a gritty grind down an alley. In chronological fashion, Maher and others relive each game of the 1970 season. Included are hand-written game notes and black-and-white photos that offer a glimpse into a time when football was often more fight than finesse, when the sport was part bare-knuckled brawl. 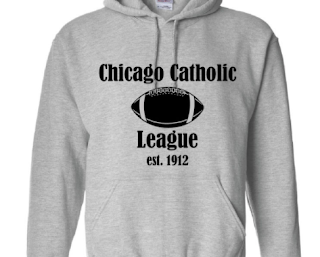 personality and more--Maher is an unabashed fan of Chicago Catholic League football. In “3 Yards” he tips his cap to the states of Texas, Ohio, California and Florida—long known for their powerhouse prep football teams. But he adds that if any schools from those states want to play “a real game of football,” they should contact the CCL. Maher dedicated the book to his mother, Mary Jean, and his father, John, a 1944 St. Rita graduate and football player who joined the Marines and earned a Purple Heart fighting on Okinawa. One of the well-wishers at the book signing was Bob Wojtalewicz, co-captain of the 1970 St. Rita championship team. Tim Maher (right) and Bob Wojtalewicz. No Neil Sullivan in the picture?? Is Neil Sullivan one of the players in that picture? If so,which one?